Profile Response: Alana Wilson, Boulder, CO | How Will We Live Tomorrow? Alana Wilson is a member of the Chrysalis, coop, a sixteen member cooperative living group in downtown Boulder. Except not right now. This summer, Chrysalis is sharing a fraternity house with their sister coop, Masala, while both of their houses are being renovated. Alana is a PhD student in Hydrology with a special focus on frozen water environments (studying the variation of snow melt vs. glacier melt in High Asia). Unlike many graduate students, Alana is deeply involved in her local community, both Chrysalis and Boulder. She is informed and active in local issues, particularly when it comes to housing, which is a complex, lightning rod issue in Boulder. Boulder, home of University of Colorado main campus, has a reputation as an uber progressive community, yet not all progressive experiments yield the desired results. Boulder has a strict ‘no growth’ ring around its core in order to curb sprawl. This is desirable, in theory, yet results in inflated real estate prices of existing homes and triggers up to 60,000 people each day commuting by car to Boulder because housing near jobs is both expensive and rare. The environmental benefits of the ‘no growth’ ring are more than offset by the fossil fuels required to enable all that commuting. Boulder also has strict limitations on household size, a feature common in college towns; no more than four unrelated adults in the downtown core, three in the rest of the city. This inhibits shared living situations, which offer high density, more economical, and more sustainable living. Boulder has three city-sanctioned cooperatives (Chrysalis and Masala are two). A recent proposal to allow legal cooperatives for older people seeking to live in community could not even get to a City Council vote. The interests of private homeowners here, like everywhere else in the U.S., are strong. Yet there are curious ways in ways in which Boulder supports its coops. They are considered affordable housing, and as such, qualify for certain advantages. The Chrysalis renovations are being funded through the city from a fund supported by developer contributions in lieu of providing a minimum 20% affordable component in new developments. 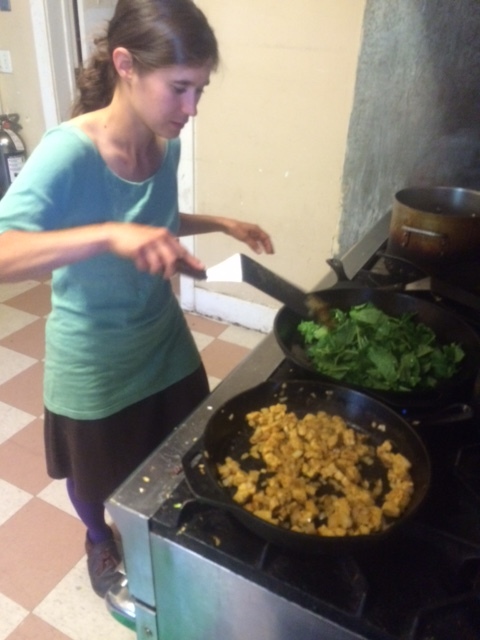 As low income housing, the coops also receive food from Boulder Food Rescue, an innovative program that collects viable, though unsellable, food from local markets and distributes it to the community. I arrived just after the Saturday shipment from Whole Foods arrived. The kitchen overflowed with out-of-date pastries, slightly blemished fruit, and more fired chicken than this mostly-vegetarian group would ever eat. Coop members sorted through the goodies, and then gave much of them away to other neighbors. Which leads to the fact that Alana and other Coop members don’t live as they do just to prickle the city. They want to live in community. Coop members devote time to cook and clean, but also to meet regularly, to take workshops in communication and conflict resolution. Living in a community is their choice, and they invest time and energy to make their groups vital. Alana has lived at Chrysalis for three years. With a turnover rate close to 30% a year, she is a senior member. The mix is pretty even men and women, and the group’s first mom with two children is moving in this fall. When an opening occurs, there are typically twenty applicants who want the spot. The demand for cooperative living in Boulder far exceeds supply. Alana thrives on living in community, but sees limitations due to legal restrictions that promote nuclear family housing over other models. As coop members age they want an ownership share in real estate, but group home ownership of more than three people is not allowed in Boulder. 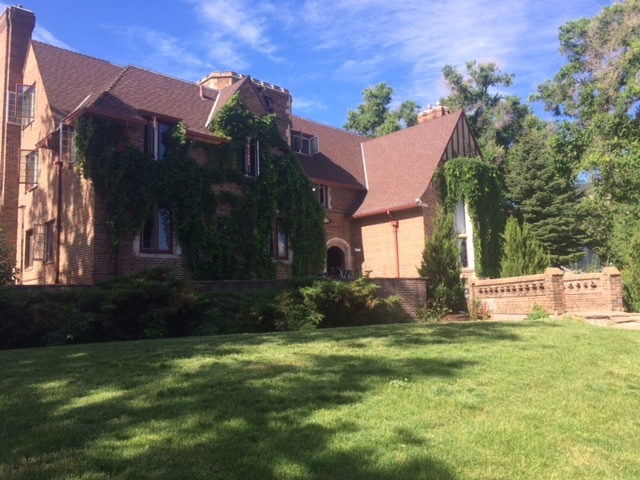 This entry was posted in Responses and tagged Boulder CO, Chrysalis Coop, cooperative housing, Masala Coop. Bookmark the permalink.